It is a rare occurrence when a video game has the ability to move a person in a way much like the films of today. In 1998 video game director Hideo Kojima blurred the line between game and movie with the release of his first masterpiece, Metal Gear Solid. Nearly ten years later, this now ancient PlayStation title has spawned three direct sequels and a number of spin-offs. 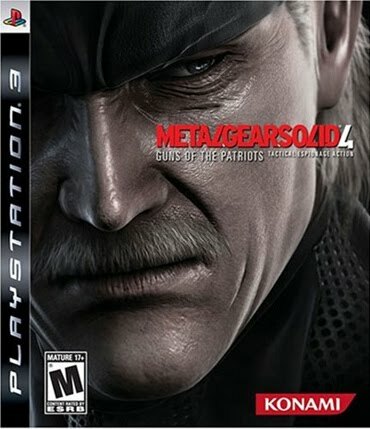 Claimed to be the series' "swan song," Metal Gear Solid 4: Guns of the Patriots provides an immersive experience that not only raises the bar for its in-game storytelling and technical proficiency, but also boasts the ability to emotionally affect and change the player's worldview. The Metal Gear Solid series has always been close to my heart, and the fourth iteration is no exception. By nature I am not all that competitive; for me video games are a means to relax and unwind after a long day. What I look for in a game is a good story; one that sticks with me long after the game is over. One might have difficulty understanding why I look to a video game instead of a movie for good narrative and a solid plot. However, what they don't understand is that there is an additional layer of immersion within a story that only a video game can provide. Metal Gear Solid 4 delivers on this level and provides a gripping story up to par with today's Hollywood blockbusters. From fleshed out characters to underlying moral agendas, this game has got it all. And if any complaint were to be made, it would be that this game relies too much on story driven cut-scenes to progress the plot. Personally, I have no problem setting my controller aside and watching some of the game's most impressive cut-scenes. This, however, is not for everyone. The game itself took me over twenty hours to complete and approximately half of that time was dominated by in game cinemas. Regardless, rhere is an option for those who do not care to watch the scenes to skip past them and get right into the gameplay. Speaking of gameplay, MGS4 improves on its predecessors dramatically. The one gripe I had always had with the Metal Gear series was its outdated and often frustrating gameplay. Konami scrapped the old-school overhead view, and "westernized" the camera and controls. It is important to note that while the gameplay is vastly improved, it still takes some time getting used to. The controls, while streamlined, are still quite complex and require a bit of a learning curve to overcome. While somewhat complex, this level of complexity is absolutely necessary, as MGS4 opens an endless number of ways to play the game. From straight-up stealth to first person run-and-gun, the way you play is completely up to you. There is a plethora of different weapons, and the ability to customize each weapon to your liking encourages the gamer to replay the game a number of times to experience all this game has to offer. What gripped me more than anything was the level of presentation; I have never seen such a polished game experience. Riddled with traces of Japanese humor, dramatic fight scenes and over the top plot twists, this game will have you on the edge of your seat until the very end. The entire game is run on the in-game engine and each cut-scene seamlessly transitions into gameplay. The game itself is broken into five self-contained acts spanning five vastly different locales, pushing the PS3's power to its limits. The game itself fills up an entire Blu-Ray disc, an equivalent of over six DVDs! The graphics and sound compete with the likes of Uncharted and Gears of War. This game is art. Kojima once again pushes the envelope, essentially redefining the video game medium. You will come away from this game changed. There has been much talk as to what defines the next generation of videogames, but I'm telling you that this game is the ushering in of a new generation of games. If you are hungry for a solid narrative and an immersive experience, go out and buy this game now. You will not be disappointed. In addition to the fantastic single player, MGS4 includes Metal Gear Online, a place where you can test your stealth skills against other gamers around the globe. Boasting a number of different game types and the same great gameplay found in the single player, there is much for fans to love. Unsurprisingly however, this multiplayer component is no Halo or Call of Duty. The registration process alone reminds you why Xbox Live is still leaps and bounds over the PlayStation Network. Regardless, there is still fun to be had here. In addition to contributing to Ani-Gamers, Alex writes news (and the occasional anime review) in a freelance capacity for IGN. You can follow him on Twitter and check out his video content on YouTube.